This Fall’s Featured Food is Soy. Soy is a bean of the species legume. Soy beans come in various sizes and colors, including black, brown, blue, yellow, green and mottled. In China, soy is known as the large yellow bean. In America, the golden miracle bean. Soy is native to East Asia. Soy is believed to have likely originated around 5000 years ago, in a region including Northern China and Inner Mongolia. Emperor Shennong is considered to have been the father of Chinese agricultural practices and herbal medicine ~2900 BC. He named five sacred plants: rice, wheat, barley, millet and soy. Soy spread throughout Asia via trade from the first century CE to the 16th century, where it became a staple food. From Asia it was introduced to Africa and the rest of the world. Soy is now a major crop in the US, Brazil, Argentina, India and China. Soy is valued not only as a food, but used to nutrify soil, a source of oil, and food for livestock. When various soy-based foods, like tofu, miso, and soy sauce, were invented is unclear, but they likely originated in China and Korea. Tempeh is believed to have been created later in Indonesia. Traveling Chinese and Korean Buddhist priests popularized soy-based foods in countries they visited. Japanese who converted to Buddhism became vegetarians and grew to love the new source of protein. Tofu, salty miso paste, sticky natto and soy sauce were the main soy-based foods introduced. Setsuban is a celebration in Japan on the day before the beginning of Spring. Traditionally, the Japanese as well as many countries, followed the lunar calendar. The lunar calendar celebrates New Year at the Spring Equinox. Festivities generally focus on symbolically driving away “evil spirits,” and cleansing oneself for the year to come. Roasted soy beans are often thrown out the door, or at a family member wearing a demon mask, while saying “Demons out! Luck in!” and slamming the door. Eating sweet black soybeans on New Years Day for good health and fortune is also a common tradition. Each family member has to eat as many beans as their age, and then one extra bean for the New Year. People in Japan also celebrate this tradition at a Shinto shrine or Buddhist temple’s Spring festival. Temples will often select an honored guest celebrity, such as an actor or wrestler. Priests and guests will throw lucky roasted soy beans and small envelopes filled with prizes like candy or money to visitors. Soybeans are said to have been first introduced to North America in 1765 by sailor Samuel Bowen. Bowen claimed he had traveled throughout China for four years as a prisoner. When he returned to Savannah, Georgia, Bowen grew soy and made soy sauce, which he sold to England. He researched soy sprouts as a source of vitamin C to help the British Navy fight scurvy, for which he received a gold medal from the Society for the Encouragement of Arts, Manufactures and Commerce, and a gift of £200 from King George III. The soy bean did not immediately catch on in the US as a food. Soy was initially used as a forage crop for grazing livestock, livestock meals, industrial products and oil. Soy was also used to regenerate soil due to its nitrogen-fixing properties. During World War II, trade routes for edible fats were disrupted. Soy and canola acreage grew dramatically to join corn in filling the need for cooking oils in the US. Meanwhile, soy food products were being developed by companies like the Seventh-day Adventist’s Loma Linda Foods, from the 1920s onward. Soy as a food slowly grew in popularity in the US as part of the health food movement. In the 1960s, the environmental movement joined hands with vegetarianism, and soy took center stage as a source of complete protein with a lighter ecological foot print. While “meat analogs” still remain popular, recent artesanal and whole foods movements have renewed interest in traditional minimally processed soy foods. Fermentation is used in the making of most traditional soy-based foods. This is because they were created before the use of refrigeration for food preservation. Fermentation was a way to preserve soy beans and create different textures and tastes. Tempeh, soy sauce, miso paste, and natto are all made using fermentation. Fermentation involves the use of beneficial (or “good”) bacteria, mold and fungi. These organisms are often referred to as “probiotics.” They help prevent harmful organisms that can make us sick from growing in the food. Fermentation may also improve the nutrient content and digestibility of food. The helpful probiotic organisms eat the food, breaking down substances that can inhibit digestion, and producing nutrients. Soy beans are high in phytates. Phytates can bond with minerals in the digestive tract, inhibiting their absorption into the body. Probiotic organisms consume and thus break down phytates, increasing the absorption of minerals iron, zinc, calcium, and magnesium. Gas-producing oligosaccharides in the food are also broken down. Nutrients like vitamins B12 and K can be made by probiotic organisms. Short-chain healthy fats can be produced, improving satiety through slowed gastric emptying. Soy beans contain “prebiotics.” Prebiotics are indigestible fibers found in plants. Plants high in prebiotics include beans, onions, garlic, jicama, asparagus, burdock, chicory, jerusalem artichokes and whole grains like oats, wheat, and barley. They pass through the human gastro-intestinal tract undigested. Prebiotics feed probiotic organisms, which produce gas. When probiotic organisms eat the prebiotics prior to humans eating the fermenting food, the benefits of the probiotics are still received, while reducing flatulence. Gut-associated lymphoid tissue (or GALT) in the gastrointestinal tract is an important part of the body’s immune system. GALT works to protect the body from invasion, inflammation, and keep us healthy. Probiotic organisms we eat in our food, populate our gastrointestinal tract. Each person has a unique colony of trillions of organisms living in their gut related to their diet. The colony of probiotic organisms helps control the GALT immune system. Fermented soy-based foods are believed to contribute to a healthy probiotic colony, and immune system. Glutamate (also known as monosodium glutamate or MSG) is an amino acid that enhances food’s savory “umami” flavor. Glutamate is one of the most abundant naturally occurring non-essential amino acids. It is found in many foods, like tomatoes, peas, corn, mushrooms, grapes, seaweed and seafood. It is also produced through fermentation, when probiotic organisms break down protein’s amino acids. Examples of foods containing glutamate from fermentation include beans (e.g. soy), seafood, yeast, and cheeses. The concern over MSG’s possible effect called “Chinese restaurant syndrome” originated from a speculative letter from Robert Ho Kwok to the New England Journal of Medicine in 1968. Kwok wrote that he experienced numbness, general weakness, and palpations 20 minutes after beginning a meal at a American Chinese restaurant lasting for about 2 hours before ceasing. Since then, an anecdotal list of symptoms has grown. Since the publishing of Kwok’s letter, extensive research has been conducted on the safety of MSG. Under rigorously controlled conditions, even in studies with people convinced of their sensitivity to MSG, no association between MSG and the proposed symptoms has been found. Under normal conditions, humans are believed to effectively metabolize relatively large quantities of glutamate. Researchers acknowledge, though, that a small percentage of people may have short-term reactions to MSG. Symptoms are usually mild and don’t require treatment. To prevent a reaction is it is recommended such people avoid foods containing MSG. MSG has been generally recognized as safe (GRAS) by the US Food and Drug Administration. Soy contains phytoestrogens. The possible effects of these phytoestrogens has been a heated topic. Initially marketed as a miracle health food, soy later became demonized, in part due to research indicating possible ill health effects from soy’s phytoestrogens. These studies however had numerous shortcomings including short durations, using rodents who metabolize soy differently than humans, and high amounts of concentrated soy isolates. Recent studies are painting a more favorable picture of soy. In 2012 a large study was published pooling study analysis of almost 10,000 female breast cancer patients from the US and Asia. Consuming at least 10 mg of isoflavones daily was linked to a 25% decrease in breast cancer recurrence after ~7 years. The American Cancer Society’s 2012 Nutrition and Physical Activity Guidelines for Cancer Survivors concluded that current research finds no harmful effects from breast cancer survivors eating soy. Choosing natural soy products, free of soy isolates is recommended. 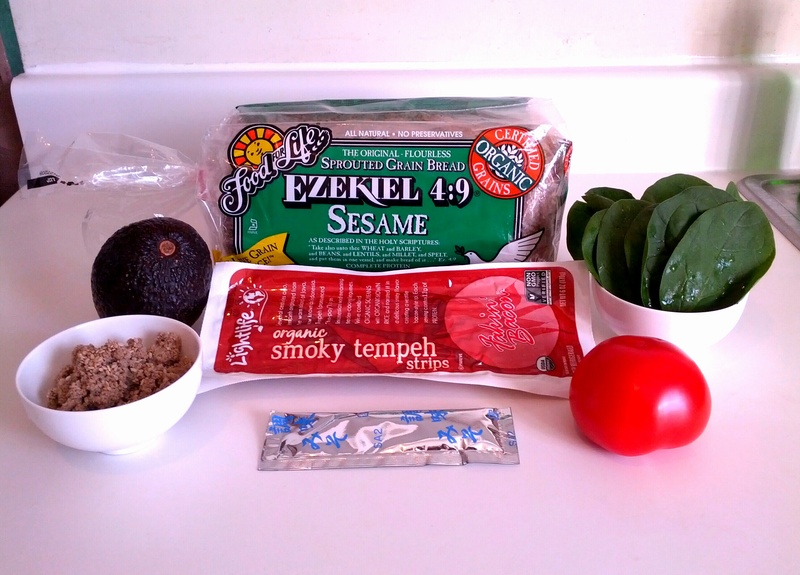 Tempeh is a fermented soy food. It is one of the few traditional soy-based foods to have been originally discovered outside of China, in Indonesia’s Java. Historians suggest tempeh was accidentally produced when discarded soybeans at a tofu factory caught the spores of and grew an edible white fungi. This fungi grows on banana leaves, which were traditionally wrapped around soybeans when making tempeh in Indonesia. Unlike tofu, tempeh is made from the whole soy bean, giving it a higher content of fiber, protein, and vitamins. Soy sauce is said to have originated in China as a way to “stretch” salt, historically a costly commodity. The condiment made from a fermented paste of boiled soybeans, salt, and molds. It can also contain roasted grain. After fermentation, the paste is pressed, producing the liquid soy sauce. A study conducted by the National University of Singapore indicated Chinese dark soy sauce can contain 10 times the antioxidants of red wine. Some brands of soy sauce are made from hydrolyzed soy protein instead of traditional fermentation due to its shorter production time, reduced cost, and longer shelf life. Such hydrolyzed soy sauces can contain high levels of the carcinogens 3-monochloropropane-1,2-diol (3-MCPD) and 1,3-dichloropropane-2-ol (1,3-DCP). The United Kingdom Food Standards Agency recommends avoiding these products. Tofu is believed to have been invented around 150 BC during the Han Dynasty in China. Tofu is made from soymilk, much in the same way cheese is made from milk. Soymilk is made by grinding beans with water, heating, and straining them. Then a firming coagulant is added to the soymilk to form curds, which are pressed into soft white blocks of tofu. Miso is a traditional salty Japanese seasoning paste made from fermented soybeans, salt, and koji fungus. It is used to season soup, and in sauces and spreads. The taste, aroma, texture, and appearance of miso vary. Region, season, temperature, fermentation duration, salt content, variety of koji, and fermenting vessel can all effect the miso. Fermentation time ranges from as little as five days to several years. Tamari is similar to soy sauce, but is darker and richer in flavor. Tamari is made from the liquid that runs off of miso as it matures. Soy beans are rich sources of “complete” protein, calcium, potassium, folate, healthy fats, and fiber. 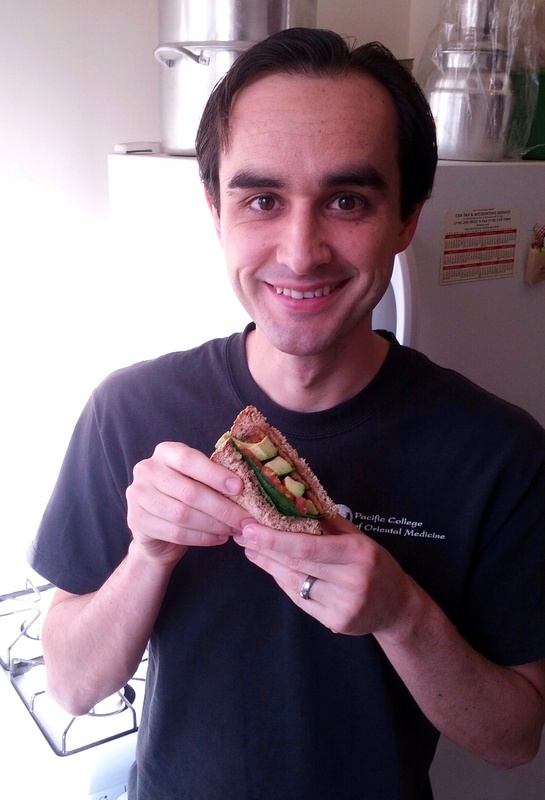 This Fall’s Featured Recipe is for a Tempeh BLT Avocado Sandwich. A key part of the optimal tempeh experience is marinating and crisping the tempeh. Marinating in a flavorful sauce, slicing thin and crisping its exterior while softening its interior, will eliminate tempeh’s slightly bitter bland flavor and tranform it into a food one’s family will crave. 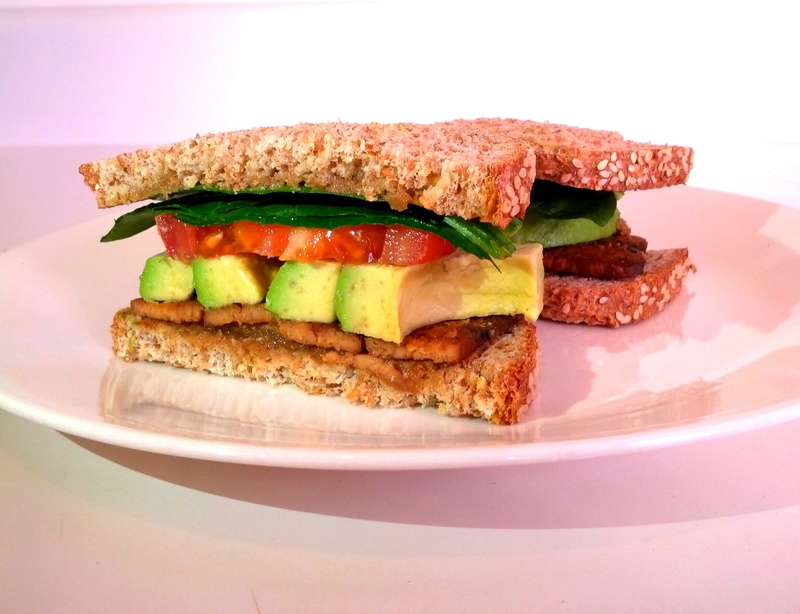 Our Tempeh BLT Sandwich calls for pre-seasoned, sliced tempeh, making it convenient and easy to prepare. Sprouted breads, like the “Food of Life” brand used in our recipe, can contain a variety of grains and legumes, including sprouted soy. Miso paste can be a flavorful and healthy alternative to conventional mayonnaise. Our recipe uses pure miso paste, but there are many delicious spreads made with miso on the market to try. Nut spreads, like cashew butter, are another tasty option. Variations: Add a poached egg or one’s favorite cheese. 2. Spread bread with miso spread or favorite sandwich condiment. 3. 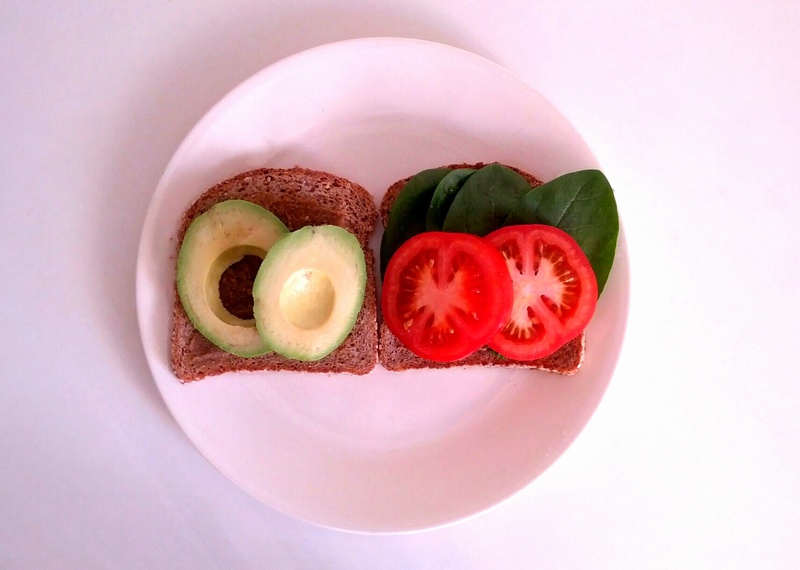 Top bread with lettuce, tomato, and avocado. 4. Heat pan on medium heat. Add 1 teaspoon of oil. Saute tempeh until crisped and golden brown. 5. 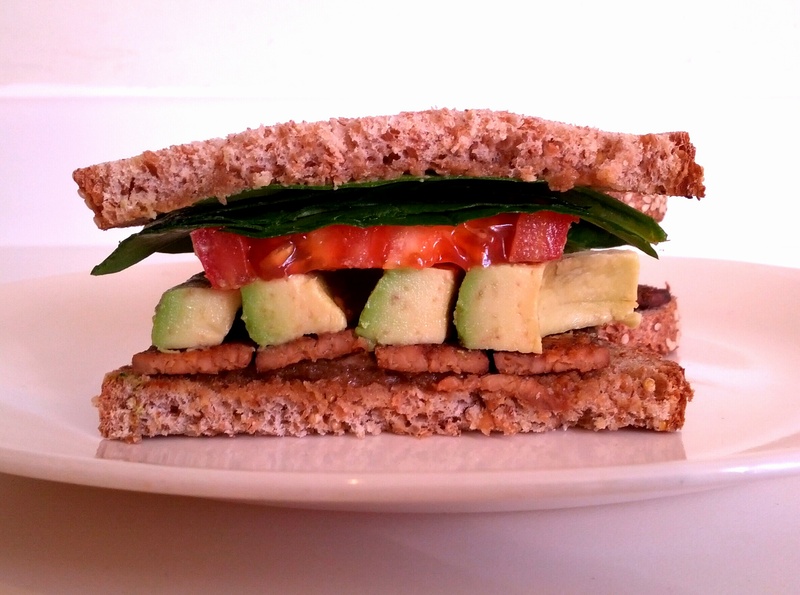 Place crisped tempeh inside sandwich. Enjoy! 1. William Shurtleff, Akiko Aoyagi. The Book of Tempeh. Harper and Row Publishers 1979. 2. William Shurtleff, Akiko Aoyagi. The Book of T0fu: Food for Mankind. Autumn Press, Inc 1975. Page 68. By William Shurtleff, Akiko Aoyagi, Page 1386. 5. Lindsey Getz. Soyfoods & Cancer. Today’s Dietitian, Vol. 15 No. 4 P. 30, April 2013. 6. Nechuta SJ, Caan BJ, Chen WY, et. al. Soy food intake after diagnosis of breast cancer and survival: an in-depth analysis of combined evidence from cohort studies of US and Chinese women. Am J Clin Nutr. 2012; 96(1): 123-132. 7. William Shurtleff, Akiko Aoyagi. History of Tempeh and Tempeh Products (1815-2011). Soy Info Center 2011. 9. Bhavbhuti M. Mehta, Afaf Kamal-Eldin, Robert Z. Iwanski. Fermentation: Effects on Food Properties. CRC Press 2012. 10. Slamet Sudarmadji, Pericles Markakis. “The phytate and phytase of soybean tempeh.” Journal of the Science of Food & Agriculture 2006. 11. Questions and Answers on Monosodium glutamate (MSG). U.S. Food and Drug Administration. November 19, 2012.